The Sahara desert, in northern Africa, is only the third-largest desert in the world. But it's the most recognized, and defines what we think of as a desert region. Endless sands. Brutal heat. Very little life. Rare water sources. In other words, the roughest of rough terrain that Jeep drivers love to find. That harsh region inspired Jeep to create the Sahara edition of Wranglers, first starting in 1987. Equipped with many standard Jeep features, they also featured unique trail-cloth seats with storage pockets, front bumper-mounted fog lamps, distinct high-back bucket seats and a rear removable seat bench - as well as eye-catching badges and icons. 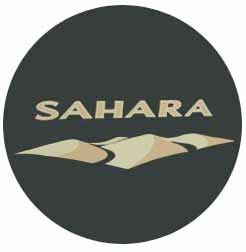 Our Sahara Jeep Tire Cover features that bold logo of desert dunes emblazoned on a black soft-top material. Custom made by OEM Mopar to fit your wheel size, it protects your spare tire from the heat of the desert sun, and whatever else nature will throw at it. And because it's made by Mopar, the colors and logos will match perfectly. Let your Jeep have its day in the sun with this sharp-looking Sahara tire cover. Looks great and fits perfectly. I like how it looks on the back wheel. Has smooth look with no ripples showing. Easy to install. Easy to install. Start at the bottom with the split seam centered directly at 180 degrees. Then work the top at 360 degrees onto the tire. Keep working until you get the whole cover onto the tire. Back up 25 feet and look to be sure ithe cover is level. It's simple. You have it finished. ConsMake sure you have the cover level periodically. Clear instructions about loosening the spare to fit the cover in front of the brake-light bracket. It's a snug fit, but there's enough play to center the logo. ProsProvides a nice finished look. The appearance of cover was perfect and shipping time was fast. Easy order and processing. Item looks and fits great! ProsExactly as described. Easy to order and receive products from this company. Nice quality and perfect fit that's a great accent to my vehicle. Reasonably priced. ProsAn inexpensive way to add style. Prosas described and perfect fit. Excellent! solid material and fit. Very attractive accessory. This was bought as a gift for my husband for father's day by our kids. The look of surprise and pleasure was great to see. It is very easy to install and looks great on our Jeep! Looks great on the wife's Sahara Unlimited. Buy it! ProsPrice, product quality and speed of shipping. I wanted to replace my spare tire cover...it was an eye sore to me. The dealership I bought My Jeep Wrangler from wouldn't get me a tire cover that matched it...not even a plain black one. Instead they put a cover on it with the dealership's name and town on it. It was an eye soar to me. It was bad enough that that the new spare tire was a different brand and tread pattern on from the new tires they put on my Jeep. NOW...my Jeep Wrangler's look has improved greatly. Thank youLooks Just For Jeeps. ProsLooks really good on my Sahara Edition Jeep Wrangler. ConsI haven't found any issues with it yet and don't think I will. I even took it off in the winter time to check the air pressure in my spare tire and it wasn't much more difficult to put it back on compared to the summer time. My SAHARA spare tire cover arrived in just a few days. It was easy to install and looks great. The decal color matches my Dune Jeep color perfectly. If you had hood decals, I would buy them immediately! ConsAfraid someone will steal it--have to keep an eye on it. i was really happy wit the fit the shipping time was outstanding!!!!!! !